Liverpool play Bournemouth in the Premier League this weekend and Jurgen Klopp’s side will be looking to get closer to a top 4 finish, especially riding high after the success against Dortmund. The Merseyside giants will be full of confidence heading into this one, post their emphatic 4-3 win over Dortmund in the Europa League quarter-finals. On the other hand, playing Bournemouth would not be a cakewalk, as they have established in the last few games. And, it will be quite a challenge for the visitors. Especially with Liverpool having so many midfield injuries and less time to recover after a Thursday night game. Bournemouth have done well against the likes of City, United and Chelsea earlier this season and it will be an interesting game to see if Liverpool continue the winning streak. Bournemouth winger Junior Stanislas could return from a hamstring injury, but Benik Afobe will miss out with his own hamstring problem, while Adam Smith continues his rehabilitation from a hernia and Harry Arter is also not yet fit. Callum Wilson made a brief substitute appearance at Aston Villa last week following six months out with a knee injury, and is expected to be involved again. Liverpool, meanwhile, are expected to rotate following Thursday night’s dramatic Europa League win over Borussia Dortmund, with Joe Allen among the likely starters. Midfielder Emre Can picked up a foot injury against Dortmund and is likely to miss the trip to Bournemouth. Club captain Jordan Henderson is already out for the season. Defender Joe Gomez and striker Danny Ings are out for the season as well, while Christian Benteke is a doubt with a minor injury. Liverpool have never lost a competitive match against Bournemouth, winning six times and drawing twice. The Cherries have scored just four goals in those eight meetings, and never more than once in a game. Liverpool have twice beaten Bournemouth 1-0 at Anfield this season, once in the league and again in the Capital One Cup. James Milner has been involved in 14 Premier League goals this season, scoring five and setting up nine. It’s his best return for six seasons. Daniel Sturridge could start four successive league games in a single season for the first time in two years. Elphick was an ever-present in the Cherries’ Championship promotion campaign but he was sidelined for around four months this term due to an ankle injury. The 28-year-old returned in January but has had to bide his time since having been restricted to just one appearance as a substitute in the Premier League and two starts in the FA Cup. Elphick is one of the best captains and Bournemouth have missed him undoubtedly. It was a good decision to give him the opportunity back in the team and for him to take it and to lead Bournemouth to victory. It was indeed a big moment for the club. He will want to make up for lost time and make the most of this chance. He started Bournemouth’s first five Premier League games and will be keen to hold on to his place in the first XI in the remaining games of the current campaign. The 23-year-old Brazilian is skilful, creates goals for his teammates and well as scores goals himself. The playmaker has scored a lot of crucial goals for Liverpool, including a vital away goal at Old Trafford as Jurgen Klopp’s side beat Manchester United 3-1 on aggregate in the last 16 of the Europa League. He also scored a spectacular long-range drive in the first half of Liverpool’s 3-2 defeat by Southampton on March 20th. Coutinho will be looking to carry forward with his goal-scoring, and to ensure that Liverpool edges closer to securing a top 4 finish. Bournemouth unfortunately lost at Anfield at the beginning of the season thanks to a couple of controversial decisions. However, Bournemouth have been doing pretty well in terms of performance, and this match could also end up going their way. 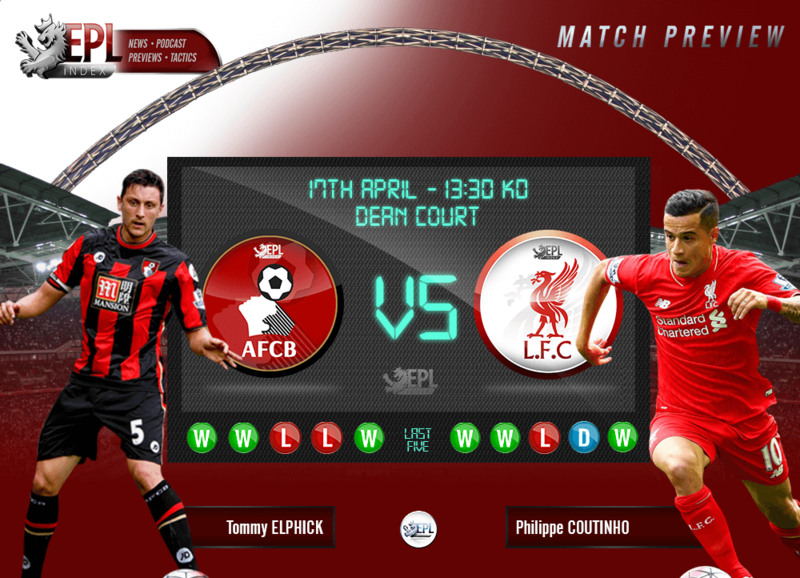 However, the match is most likely to end up in a 2-1 victory for Liverpool. Categories: Bournemouth, EPL Index Featured Article, EPL Index Match Previews, Liverpool, and Liverpool (NN).' 'Tags: Adam Smith, Benik Afobe, Bournemouth, coutinho, Dortmund, Emre Can, english Premier league, English Premier League Stats, EPL, EPL Index, EPL Index Match Previews, EPL Match Preview, epl opta stats, EPL Previews, EPL Stats, EPLIndex Match Preview, EPLIndex Match Previews, Europa League, James Milner, Joe Allen, Jordan Henderson, Jurgen Klopp, LFC, Liverpool, Liverpool (NN), Philippe Coutinho, premier league, Premier League Match Preview, Premier League Previews, Premier League Stats, and Tommy Elphick.